I shift to working on the website, but realize I have to multi-task, not focus on single projects. So I start working on video again as well. I start making videos about building the first wound pickups for the dulcimer, both to clear the already loaded clips off the hard-drives and because that story is a priority. I can’t help being a pioneer it seems. And I make a final Tour Journal to provide background for the studio journals, why I’m there, the bigger picture, so I can focus the studio journals on what I am doing right then. I am working way too hard, feeling the time slipping away, up early and staying up late. I have to learn the new xhtml standards and Cascading Style Sheets (CSS) so I can code the new web pages using them, eventually I’ll have to rewrite the entire site. For now I just need the new menu system, the “front end” people will interact with mostly. I mix video then study and work on coding the website while the clips load, video renders, I transfer files over my LAN from the windows studio computer to the linux box, where I backup files to DVD. Sometimes I sleep while the computers work on something, waking up just long enough to initiate the next process, and lay back down. I have to get this done this summer, but weeks are slipping away. I go nowhere. I try to get outside for an hour or so a day, work in the yard, get some sun. I don’t know anyone up here any more, so have no reason to get out. Usually I would be playing, and getting out among the people when I do. Now I live a solitary life, staring at the computer, trying to eat and sleep enough. I play the piano, working on new songs, or just playing. surprisingly, one of the promoters, Jane, and Dave, call me up and get me to come out one night to listen to music. I go downtown with them, we find a place. I have super-sensitive hearing, so it is too loud for me to hear them talk, so I just drink a few glasses of wine and dance. It is funny and almost pathetic, but this room full of, well, pretty young people, and none of them will dance. So it goes, I dance alone till closing time, a great evening. Though in the end, it is the same as playing. I’m still alone. Jane and Dave head home, and I walk down to the docks. I know this place well, and go where it is quiet. Perhaps there is someone like me down there, a girl like me. There never was, and isn’t now, though I think of her, wonder if she would want to come down and sit here after a night of dancing, or playing, let the wine and adrenaline wear off. I guess I’ll never know. I sit an look out at the dark water. I learned to sail near here on this river. With the city at my back, I am closer to nature here, as a gull flies by. I have sat on many docks like this in many places, seeking a quiet place. I end up talking to the night watchman for a bit. I love the street for just that, it is where the people are, if you are willing to talk and to listen. I love to learn how other people see the world. He’s from Ethiopia. Seems that often people from other countries, less developed ones, are more interested and willing to talk of the deeper things of life. So we naturally talk of life, and what moves us, of god and spirit, and then he gets back to his rounds, and I head back to the studio. 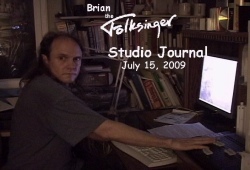 This entry was posted on Thursday, July 16th, 2009 at 11:34 pm	and is filed under Studio Journal. You can follow any responses to this entry through the RSS 2.0 feed. Both comments and pings are currently closed.